You are here: Home / news / Secretsundaze, Just Bloody Brilliant. On Sunday 26th May Secretsundaze are commandeering the Oval Space for one EPIC bank holiday hoe down. 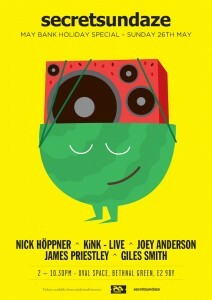 Headlining the show is legendary, awesome, amazing and incredibly influential House and Techno master Nick Höppner. He’s really great. You will dance and you will LOVE IT. Hot on his heels will be KiNK. Now this is a man who loves what he does and isn’t afraid to show it. The Bulgarian-born producer was voted 5th in Resident Advisor’s Top 20 Live Acts of 2012 poll in December. He’ll be bringing a powerful hit of energy and enthusiasm to the party. You will flail with wild abandon. Following him will be rising star and cutting-edge talent, Joey Anderson. This will be the London debut for this Jersey native; welcome him with enthusiastic pelvic thrusting. Joey covers the most abstract Techno, right through to more traditional soulful New York vibes. You will thrust like there’s no tomorrow. Completing the lineup are two of the finest residents in all the land; James Priestley and Giles Smith. This pair always ensure the party opens and closes in the most glorious style. You will party like it’s 1999. Not only will your ears be absorbing sonic treats fit for a Sheik, but so will your mouth, taste buds and belly. Oval Space will be cranking the BBQ OF YOUR DREAMS, meat supplied by The Ginger Pig Butcher. He’s a real nice guy; his pigs happily roam the Yorkshire Moors, dine on the finest organic swill and receive daily pedicures. When its finally time to go to piggy heaven they are escorted to an on-site cinema and shown old Monty Python clips. They literally laugh themselves to death. What a way to go. Secretsundaze ey? Aren’t they good? Bloody brilliant in fact. But wait, I know what you’re thinking; “what about my post party foot rub?”. These will be delivered to you the following morning, along with a slice of ‘shut the hell up!’.